The new generation of Silverstone chronographs bring unprecedented performance with the Silverstone Endurance 24HR. For the first time, this piece of technology proposes a dissociated time measurement of 24 hours race and lap time. 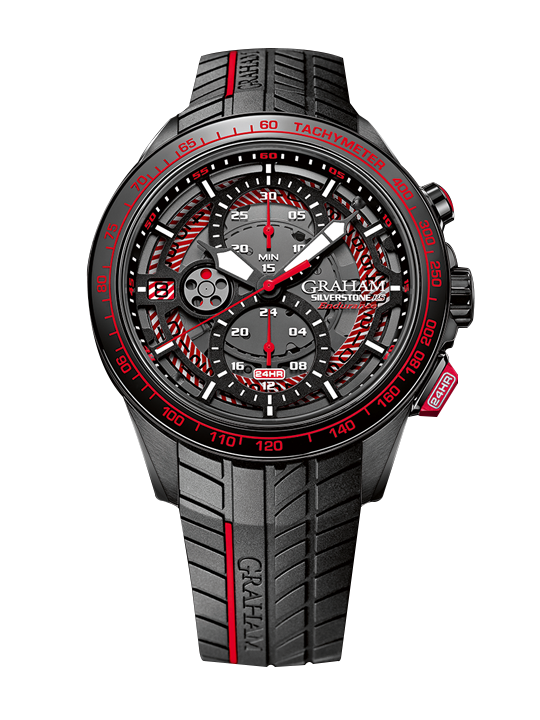 GRAHAM has developed a mono-pusher movement with a double chronograph function which meets endurance racing requirements. Functionality is improved with usage. The main measurement of lap time is operated by a start/stop/reset chronograph button which activates the minutes and seconds counting, identifiable with the red rubber catch. The number of lap times that can be measured is limitless as it functions in an independent manner. A second measurement is operated thanks to a secondary chronograph with 24HR counter and flyback, activated with the 24HR red pusher. This double function is the perfect fast-action system, ideal for Endurance racing and dual timekeeping test drives.